You only need to spend a few minutes talking to Al Wehner before you realize that he really enjoys life, especially his forage, cows, and family. All three components make up what is an integrated dairy business in south central Georgia, where dairy operations of any ilk are difficult to find. Wehner and his wife, Desiree, once were partners in an 1,100-cow conventional dairy located in Ashville, Fla. 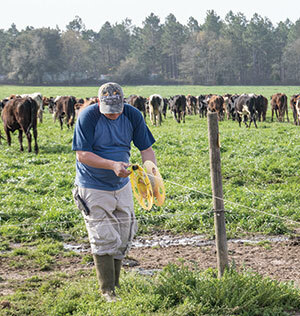 Though that enterprise was successful, in 1993 Al and Desiree decided to venture out and start their own grazing-based dairy near Quitman, Ga., located about 15 miles north of the Florida state line. Little did they know that this would be the start of something much bigger. That first grazing dairy, called Green Hill, has now ballooned into a total of five grazing platforms — three for milking and two for young stock. There is also a cheese processing/retail store and a yogurt processing operation. The Wehners’ three children and their spouses are all actively involved in ownership and management at some level. Combined, the three dairies milk 1,800 cows. All of the young stock, 1,400 in total, are also grazed from the time they are young calves. Across the entirety of farm locations, there are 1,200 acres, 1,100 of which are irrigated. “Having heat units and water is a big advantage here,” said Wehner, on a picture-perfect early March morning when Hay & Forage Grower visited Jumping Gully Dairy near the town of Pavo. “We are always pushing our ground, and it enables us to graze 365 days a year,” he added. Jumping Gully is one of the three milking cow platforms. It’s home to 550 cows that graze 220 acres of irrigated pasture. The cows are milked in a swing-30 open milking shed and bred to calve October through December, allowing for late lactation and a dry period during the hottest time of the year. Forage growth also slows during this same period. The real story at Jumping Gully is the massive amount of forage that gets produced and consumed. “Depending on the system, we get 10 to 20 tons of dry matter per acre each year,” said Wehner. Here’s how that happens. For the cows, the backbone of the system is a mixture of oats and tetraploid annual ryegrass. The preferred oat is a grazing variety developed at Louisiana State University. The mixture is seeded mid-September to mid-October, and cows are on the pastures in about 20 days postseeding. The crossbred herd grazes these pastures until May, when native crabgrass begins to reestablish. “The cows rotate through the paddocks in 10 to 16 days,” noted Wehner. “Even in a cold winter we can complete a rotation cycle in about three weeks,” he added. Most of the paddocks are five to 11 acres in size, and cattle are moved every 12 to 24 hours. During summer, about half of the dairy grazing platform is planted with corn for silage. The corn is custom planted and harvested, then stored in silage bags. Wehner noted that between the five farms there are only five owned tractors. The corn silage program is a new wrinkle that was precipitated by the rapid rise in corn prices several years ago. “We can produce 30 wet tons of corn silage per acre and those acres are only out of grazing for about 120 days,” said Wehner. “I’d prefer not to have to grow my own corn, but economically it makes the most sense right now,” he added. The milking herd is supplemented with corn silage for most of the year. When the corn silage is harvested, those fields are seeded to Tifleaf 3 pearl millet. Once established, the millet provides about 60 days of grazing in late summer and fall; then it’s back to seeding oats and ryegrass for winter grazing. Pastures stay productive with frequent irrigations. “We get about 60 inches of rain per year but are never more than three days away from a drought,” chuckled Wehner. The coarse-textured soils and lack of uniform rainfall throughout the year make irrigation an integral grazing system component. The center pivots at Jumping Gully serve four purposes. They provide water from a large aquifer to the vast amounts of forage being grown. In summer, at least 1 inch of rain or irrigation water is needed to maintain pasture and corn growth. The pivots are also used to fertilize pastures. Liquid fertilizer is injected with a pump to provide about 1 pound of nitrogen per acre per day to the growing forage. Through a separate piping system, manure wastewater from the dairy unit is also applied to pastures using the center pivots. 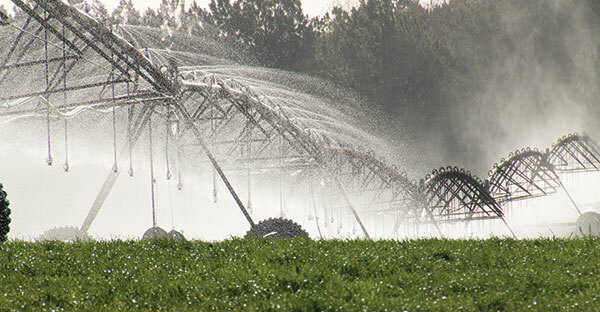 Finally, the pivots are equipped with sprinklers to keep cows and heifers cool during the hot, dry Georgia summers. “I love to see calves on pasture,” said Wehner, as he walked through the carpet of annual ryegrass and oats at the heifer farm platform near Pavo. Calves are weaned in 50 to 60 days and supplemented with a free-choice grain mix until May. During the winter months, heifer calves graze the oats and ryegrass pasture base, though some fields also include a mixture of seeded clover species. In summer, the calves graze Alicia bermudagrass, crabgrass (which Wehner really likes), and pearl millet. From May through September, they are supplemented with corn silage and gluten feed. Bred heifers are put into a leader-follower system with the milking herd during the early spring flush of grass growth. In summer, heifers are moved to a different farm where pearl millet and crabgrass are utilized as a forage source. Once the crabgrass goes dormant, oats and ryegrass are grazed during the winter until the animals are put back into a leader-follower system with the milking herd. Above: Bred heifers are moved into a paddock recently occupied by the milking herd. Beyond the success of that initial dairy established in Quitman over 20 years ago, Al and Desiree have had even greater success incorporating their children into ownership and management positions. Their son Clay and his wife, Amanda, own the cattle on Green Hill Dairy in Quitman. Clay also acts as general manager for the other grazing-based dairies, both Jumping Gully and Grassy Flats dairies near Pavo. Amanda fills the role of business office manager for the operations. Wehner’s daughter, Jessica, and her husband, Jeremy Little, own and operate Sweet Grass Dairy in Thomasville (sweetgrassdairy.com). Originally started by Al and Desiree in 2000, Sweet Grass Dairy is a retail dairy store and award-winning artisan cheese processing facility. The business sells product throughout the United States. Milk is supplied by the Wehners’ dairy platforms. The youngest son, Kyle, and his wife, Janelle (a native New Zealander), started Dreaming Cow Creamery in 2009; it’s a yogurt processing facility in Pavo that sells product under the “Dreaming Cow” label (dreamingcow.com). The milk is supplied by Jumping Gully. “We’ve learned a lot about grass-based dairying since Desiree and I started in 1993. Back then, there weren’t a lot of models to follow for a New Zealand-style operation in southern Georgia,” said Wehner. “Like everyone else, we made mistakes and tried to learn from them. We now feel fortunate to be in a position where our children and their spouses play a significant role in the operation,” he added. That no doubt makes for more time to sit back and enjoy the spoils from the forage — Sweet Grass Dairy cheese and Dreaming Cow yogurt. This article appeared in the April/May 2016 issue of Hay & Forage Grower on pages 22 and 23.